Urgh, you know the feeling. The toys have been piling up since the holidays. Worn and outgrown clothing is taking up valuable closet and dresser space. Art and school work is stuffed here and there. Dust-bunnies have moved in under the bed. It's time to get organized. 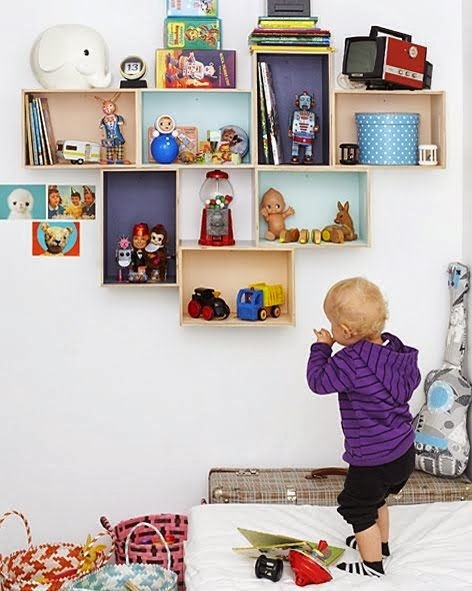 Get down to your child's eye level to help him or her get organized. Look at your child's space, storage, furniture and possessions from his or her vantage point. Adult furniture and organizing systems don't translate well to children's needs. Sticky dresser drawers are hard for small hands to manage. Folding closet doors pinch fingers and jump their rails when pushed from the bottom. To organize a child's room, solutions must fit the child. For younger children, remove closet doors entirely. Lower clothing rods and invest in child-sized hangers. Use floor-level open containers to hold toys, open plastic baskets to store socks and underwear. Resist the urge to wade into the mess alone, garbage bags flying. Gritted teeth and threats of "You will keep this room clean!" don't touch the root of the problem: teaching children organization skills and maintenance methods. Partnered with your child, you stand a better chance of devising an organization scheme and system that makes sense to him or her. If they're involved in the effort, children are better able to understand the organizational logic and maintain an organized room. Begin with clothing: sort it out! Store out-of-season or outgrown clothing elsewhere. Finally, simplify! Does your son really wear all 27 T-shirts crowding his drawer? Remove the extras so the remainder can stay neat and orderly in the available space. For younger children, a toy library is the answer to over-abundant toys. Using a large lidded plastic storage container, large box or even plastic garbage bag, entrust a selection of toys to the "toy library." Store the container in an out-of-the way place for several months. Some rainy day, bring out the toy library, swapping the stored toys for other playthings that have lost their savor. The stored toys will have regained their interest and freshness--and they won't have been underfoot in the child's room. Contain toys and other belongings before you store. Use plastic shoebox containers for smaller toys (Barbie clothes, Happy Meal give-aways), larger lidded bins for blocks, trucks and cars, light-weight cardboard records boxes for stuffed animals. Use specialty organizers to corral magazines and comic books, video games, or CDs and cassette tapes. A bonus: containers help parents control the number of toys out at any one time: "Sure, you can play with the farm set, just as soon as the Matchbox cars go back into their home!" The premier rule for efficient children's storage? Make it easier to put something away than it is to get it out. For example, store picture books as a flip-file, standing upright in a plastic dishpan. The child flips through the books, makes his selection, and tosses the book in the front of the dishpan when he's done. Compare a traditional bookcase, where little fingers can pull down a whole shelf faster than they can replace one book. Build the effort into the getting out, not the putting away. Befitting a child's shorter stature, start organizing from the bottom of the room, and work to the top. Most used toys and belongings should live on lower shelves, in lower drawers, or on the floor. Higher levels are designated for less-frequently-used possessions. Working bottom to top, the best-loved teddy bear sits in a small rocker on the floor, while the extensive Grandma-driven bear collection is displayed on a shelf built 6 feet up the wall. When it comes to keeping kids' rooms organized for the long haul, labels save the day!